One for All- the newsletter of the Alliance-Issue 2 out now! 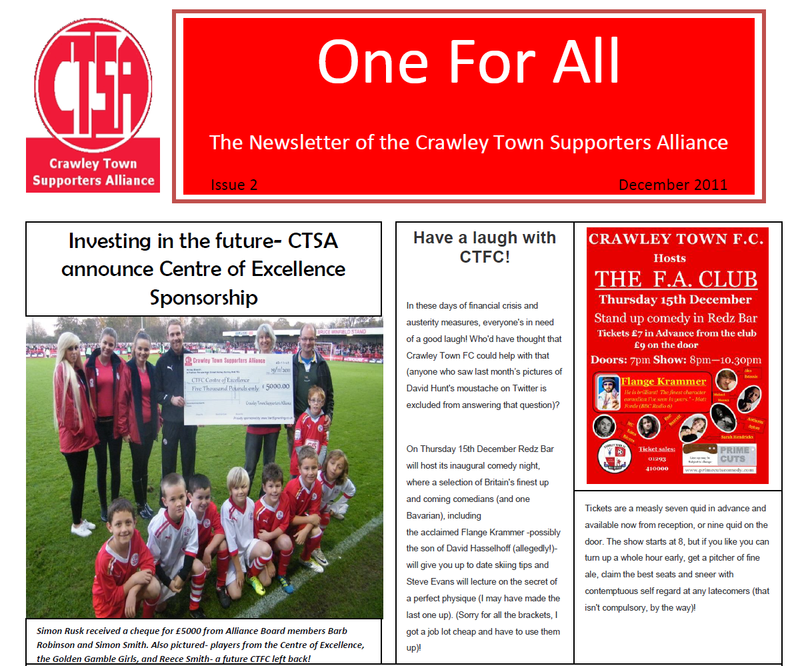 “One for All”, the newsletter of the CTSA, launches its second issue today. All members with valid email addresses will receive a copy today- so if you don’t get one, please make sure you email us and let us know the correct address -chairman@ctfcsa.co.uk. Paper copies will be available at the Burton Albion home game on Saturday, or you can read it by opening the link below. 1. Details of Half Season Tickets will be released this week. Watch the official site for details. 2. TV platform in West Stand is being moved to a more raised position as per Football League Instructions (and so that we don’t have to sell advertising space on the back of Paul Prendergast’s head!). 3. All parking options for home and away fans will be advertised on the website shortly and away clubs sent details in advance of matches. Local Business Parks will be used. 4. Inconsistency on the removal of bottle tops from drinks- different practices across the league. League regulations state quite clearly that bottle tops must be removed, and all Broadfield catering staff have been instructed accordingly. CTFC are aware that this practice has not always been carried out as well as it should have been, so reminders have been issued. They are also aware that other League clubs are less professional in this regard, but feel that it is imperative that they follow League safety rules. 5. Baked Potatoes and filled rolls will be available in Redz before every game. New stand construction will mean that every quarter of the stadium has its own tea bar.